The lightweight, hand-held Pool Blaster is the only manual pool vacuum that works independently of your pool's filtration system. Easily maneuverable for quick clean-ups, it's ideal for fountains, hot tubs, inground/above-ground pools, and corners. Poolbuster is a handheld underwater pool & spa cleaner. 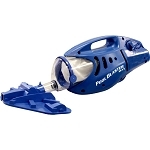 This battery powered cleaner is designed for underwater use only. No hoses, no wires! The Pool Blaster attaches to a standard pool pole. 6'' x 6-3/4'' x 17-1/2'' 6.5 lbs.